I graduated from Murray State University with a Bachelor's Degree in Elementary Education, and I am currently working toward my Master's Degree in the Teacher Leader Program at Murray State University along with an endorsement in Environmental Education. I taught 5 years at Holiday Elementary and just beginning my 4th year teaching at Millbrooke Elementary. Happy New School year, Everyone! 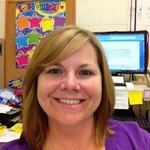 My name is Amanda Hesson and I am a Kindergarten teacher at Millbrooke Elementary. Just to name a few things about me: I have been happily married for 16 years to my husband. Together we have our son- a 9th grade Tiger, our oldest daughter- a 4th grade Cardinal, and a future Cardinal, our youngest daughter- a toddler. We also have one very spoiled fur baby- our boxer. For Family Fun, we love going to the movies, out to eat, to the park, and other places that make us laugh and smile together. As I grew, I watched my grandmother teach reading and help children, and I always knew I wanted to follow in her foot-steps and become a teacher. I worked full-time through good times and bad to get myself through school. Through the harder times, I pushed on because I knew teaching and loving my students was the best outcome I would ever receive. I never gave up. As I enter into my 9th year teaching, please know that I will teach your child to believe in himself or herself and how to manage whatever comes his or her way. I truly believe my students are my kids and I love each of them with all that I am. They are blessings in my class and I am fortunate to be a part of their lives. I will never forget my favorite teacher and how hard she worked to make me see what all I was capable of. I will do whatever I can to make sure your child is happy, comfortable, and loved everyday in my class.